The last GCCF show of 2014 saw some excellent results for RACCS cats. There were seven Russian Blues, a Nebelung and two Abyssinians entered, with the Abys in particular enjoying fantastic results. Many congratulations to new title holder Grand Champion Glendavan Caramello Koala (ABY b) on winning her qualifying Grand certificate, Best of Breed, 1st in every class and Best of Variety Foreign Adult. Special congratulations go to her stable-mate, Linczozo Clementine (ABY o) who won Best of Breed, Best of Variety Foreign Kitten and Best in Show Kitten - what a lovely Christmas present for their owner! It was a fantastic day with a record-breaking 86 cats entered - see our RACCS Show Results for a full report. A special mention goes to the gorgeous Gertie, Melkelter Galiya Gertruda (RUS a), adult by just two days, she won her first Challenge and Best of Breed, and went on to be runner-up to the best Foreign adult! But our RACCS Star of the Show was a lovely young usual Abyssinian boy, Champion Abychat Hakuna Matata, who won Best of Breed, Best of Variety Foreign Adult, and in a thrilling finale made it to the top three adults in the show - congratulations to Pumba and his proud breeder! Special mentions also go to two RACCS cats who placed in the special Supreme Show competitions: Ch Koreshka Olexsa Bluestar (RUS a) who placed 4th in their best decorated pen competition (out of over 800 pens! ); and Dushenka Orphiel (RUS a), who placed 3rd in his heat of the special kitten competition (64 kittens of all breeds entered). - Linczozo Clementine (ABY o), at just her second show won Best of Breed and Best of Variety Foreign Kitten again! - Ch Glendavan Caramello Koala (ABY b), our RACCS Star of the Show, she won her first Grand Challenge at her first try, Best of Breed, Best of Variety Foreign Adult and Best in Show Foreign Exhibit - very well done Cara! Very well done to everyone! And in Australia at a two-ring show in Perth, Australia, there were two new title holders, a top 10 winner and a best in show winner too! Many congratulations to Premier Bluebebop Madiba (RUS n) and Champion Bluebebop Jazz Nocturne (RUS n) on winning their qualifying Certificates; and Bluebebop Tyronne Turangalila (RUS a) who also won both his Challenges, and placed in the top 3 Group 3 (short-haired) entires in both rings. Our RACCS star of the show was a rare Fawn Silver Abyssinian kitten, Kimara Ataiga Heart n Soul (ABY ps), who was Best Group 3 kitten in both rings - an amazing achievement for a Silver baby! Congratulations to everyone on their excellent results. Over in Western Australia the same day, a young Russian Blue boy made a very successful adult debut – many congratulations to Bluebebop Tyronne Turangalila (RUS a) who was placed Best Foreign Shorthair and reserve to the supreme exhibit! On Sunday over in Southern Ireland there were three Russian Blues competing at the SABCCI show, held under the rules of the GCCFI – with both adults winning their Grand certificates – well done! News from shows last weekend… There were five Russian Blues and eight Abyssinians (five different colours, including a very rare Red Silver female) entered in the Kentish show on Saturday, winning 10 certificates between them all possible best of breed awards and one cat winning a new title – special congratulations to Premier Silversmoke Prima Donna (ABY p)! It was a good day for RACCS cats at the Cumberland show with 5 Russian Blues and 11 Abyssinians (in five different colours) entered. Between them they won 10 certificates, were awarded all their Best of Breeds and five cats also won new titles. There were 54 Russians (including two pedigree pets) and 2 Nebelungs entered at this year's RBBA show on Saturday, a great entry with great cats competing for the top honours. There were two new titles won, four ‘red card' days, and two 'breed firsts' for the Russian Whites and Blacks. - Grand MasterCat Dorable (Ped Pet) who won her Grand title in the minimum possible number of shows by also winning a Grand in the Ocicat show at the same venue, as well as enjoying a ‘red card' day at the RBBA and finishing her day in a Best in Show pen as Best Pedigree Pet. - GrCh & GrPr Troika Ivan Tsarevich (RUS a) who won another Imperial Certificate and also enjoyed a ‘red card' day. Special congratulations are due to the RACCS Star of the Show, Overall Best in Show winner IGrCh Koreshka Roksana Rusina, who also won her first Olympian Certificate on the day – way to go Roksi, you are a Rokstar!! There were two GCCF shows last weekend, the North West Cat Club, and South Western Cat Club shows shows. At the North West show there were two Abyssinians and one Russian Blue in the placings, all three winning their Best of Breeds, and one enjoying a rather spectacular show debut, enjoying a ‘red card' day – winning 1st in every class – Best of Variety Foreign Kitten and Best in Show Foreign Exhibit ! Many congratulations to Linczozo Clementine (ABY o), who looks set to follow in her mother's most successful little paw-prints! It really was a great weekend for RACCS cats with new titles and best of variety wins both north and south of the border, plus a breed first! - Melkelter Galiya Gertruda (RUS a), who won Best of Breed and Best of Variety Foreign Kitten again! - UK & Olympian Silver IGrPr Dushenka Zerachiel (RUS a) who won Best of Breed and his qualifying Silver Olympian certificate – the first-ever RACCS cat to achieve this title! At the back-to-back BOBCats and East Sussex shows there were 10 RACCS cats in the placings, five Russian Blues and five Abyssinians in four different colours - more than holding their own, winning 14 certificates, one new title, two best of variety wins and a Best in Show win too! Special congratulations go to Surfin Tornado (ABY p), who as well as winning Best of Breed in both shows went on to win Best of Variety Foreign Kitten in the East Sussex show. Extra-special congratulations are due to new title winner Grand Premier Troika Boris Godunov (RUS a), who went on to be awarded Best Foreign Neuter in the East Sussex show, Best Foreign Exhibit… and Overall Best in Show! At the Manchester show there were 17 RACCS cats in the placings, one Nebelung, six Abyssinians and ten Russian Blues, with some fantastic results, including three best of variety winners and a best in show winner! Many congratulations to Brumeux Man Ov Steel (NEB), who won his fourth merit and Best of Breed, and went on to win best of Variety SLH kitten and Ch Abychat Grayling (ABY a), who won the Grand, Best of Breed and Best of Variety Foreign Adult. Special congratulations go to the RACCS star of the show - Melkelter Galiya Gertruda (RUS a), still only 6½ months old, who won Best of Breed, Best of Variety Foreign Kitten, Best Foreign exhibit… and Overall Best in Show Exhibit! There were more winning RACCS cats in Western Australia with Brz GrCh Kimara Azreal Buddy Awesome (RUS a) winning Best Overall Group 3 Exhibit, and going on to win Overall Supreme in one ring and Ruby GrCh Bluebebop Scheherazade (RUS a) winning Best Group 3 Entire Cat in the other ring, and Kimara Ataiga Heart of Pippa (ABY as) winning 3rd Best Overall Group 3 kitten in one ring too. On Sunday, at a show in Dordrecht in the Netherlands, Larksong Lyonesse Limpet enjoyed a successful Dutch and adult debut, winning her first CAC. Her young uncle and aunt also made their show debuts with Bolshaya Devochka MacKryshka Dunoe winning U1 and her litter brother Bolshoy MacRusky Dunoe also winning U1 and being nominated for BIS. At the Teesside Cat Club show on Saturday there were nine Russian Blues and six Abyssinians entered with some excellent results including a new title holder, one red card day winner and two best of variety winners. Many congratulations to Melkelter Galiya Gertruda (RUS a), continuing her winning streak with another Best of Breed win, red card day and Best Foreign Kitten. Special congratulations to her older half-sister, Champion Melkelter Sybilla Luba (RUS a), who won her qualifying Challenge certificate and new title, Best of Breed, Best Foreign Adult and Best in Show Foreign Exhibit – and made it to the final three at overall Best in Show! At the West of England show there were nine Abyssinians – in five different colours - and one Nebelung entered, with all Best of Breeds being awarded (and the Coppice household taking home three of them with their three cats), and one new title winner – many congratulations to Imperial Grand Premier Coppice Via Reggio (ABY n). News from overseas with some great results for RACCS cats at a two-ring show in Perth, Australia where there was a wonderful line-up of 20 Russians. Congratulations to new title-holder Premier Bluebebop Jazz Symphony (RUS a), who was also reserve foreign shorthair in one ring, and his baby son Bluebebop Tyronne Turangalila also winning reserve best foreign shorthair kitten in one ring. But the RACCS star of the show was the lovely Baby, GrCh Kimara Blu Shimma Aschea (RUS a), who won Supreme Best in one ring. Well done to all of you! - Syrinx Moon River (ABY n) who won best of Breed, 1st in all her classes – a ‘red card’ day, and Best of Variety Foreign Kitten! - Abydreames Aedward (ABY a), who on his show debut won Best of Breed in both shows, 1st in every class in the Lincolnshire show – a ‘red card’ day and ended his day by winning Best of Variety Foreign Kitten! - Abychat Hakuna Matata (ABY n) who as well as winning the Challenge and Best of Breed in both shows, was awarded Best of Variety Foreign Adult in both, and ended his day at the front of the hall as Best in Show Foreign Exhibit in both shows - many congratulations! At the Kensington Cat Club show the same day there were four Russian Blues and two Usual Abyssinians entered, winning all their Best of Breeds and one cat winning a new title - congratulations to Champion Lestvitsa Logan (RUS a)! - Olympian Bronze Imperial Grand Premier Pontaby Ferragosto (ABY n). Gus is the first neutered Aby to scale the heady heights of Olympian, and only the second-ever Abyssinian - he also won Best of Breed and enjoyed a red card day, all this at the age of nearly 9! Our RACCS star of the show was a day less than 5 months old at the show - Melkelter Galiya Gertruda (RUS a) did it again... straight 1sts, Best of Breed and Best in Show Foreign Exhibit - very well done again Gertie! There were some excellent results for RACCS cats at the Eastern Counties show, a roasting hot day, but they all kept their cool beautifully. There were two Nebelungs and nine Russian Blues entered, with all best of breeds being awarded and a new title holder in Ch & Imperial Grand Premier Larksong Ghost Dancer (RUS a), looking absolutely scrumptious on the day – well done again Ghostie! There were three Abyssinians and two Russian Blues entered in competition at the Wiltshire show – there was a bit of confusion due to one cat’s name being missing from the catalogue, now all sorted out! Special congratulations go to new title holder Grand Champion Curtilla Czara (RUS a)! Best Foreign Kitten – Melkelter Galiya Gertruda (RUS a), her second show day, her second Best of Breed and her second BOV win! - Best neuter: IGrPr Silversmoke Ellie May (ABY o), who also won best neuter at the 2013 show, and on the day won Best of Breed and the reserve Olympian. Special congratulations to the star of the show - making her show debut in stunning style was Silversmoke Ballerina (ABY n), who won Best of Breed, Best Abyssinian Kitten and Overall Best in Show, following in the pawprints of her mother, the lovely Lucy, who won the same honour last year. It was a busy show weekend with three GCCF shows, plus the Australian Cat Federation (ACF) National Show – the Australian ‘Supreme’. There weren’t any new titles at the GCCF shows, but there were some successful show debuts, and one best in show winner! Ring 1 – Best in Show Group 3 Kitten was Osiris (V) Aussie Touch (ABY); reserve Best in Show Group 3 Adult was Kimara Azriel Buddy Awesome (RUS a); and Best in Show Group 3 neuter was Myenya Mikhail Kirovovich (RUS a). Ring 2 - Best in Show Group 3 Kitten was Osiris (V) A Star Is Born (ABY); reserve Best in Show Group 3 Kitten was Kimara Rosvel Of Zakira (RUS a); reserve Best in Show Group 3 Adult was Kimara Blu Shimma Aschea (RUS a); and reserve Best in Show Group 3 neuter was Osiris (V) Fast Talker (ABY). Special congratulations go to Myenya Mikhail Kirovovich (RUS a) who went on to be awarded Supreme Group 3 (shorthair) neuter, only being beaten by the supreme all-breeds exhibit! - GrCh & GrPr Dushenka Tashabella (RUS a), who won the Imperial Certificate and Best of Breed in both shows. - and our RACCS star of the show, now 8½ years old, GrCh & GrPr Dushenka Tashabella who won the Imperial Certificate in both shows, along with Best of Breed, straight 1sts in every class, Best Foreign Neuter in the Durham show and Best Foreign Exhibit, only just being pipped at the post by a beautiful Siamese for overall best in show! Special thanks also to Mike Eames for the lovely photographs of some of our winning cats which were really appreciated by all of us! • Premier Melisani Aslan (ABY o), who also won his title in three straight shows. • Special congratulations to Grand Champion Naughtypaw Spartacus (ABY n) on winning his grand title in the minimum number of shows before he is even 14 months old, and capping off a wonderful day by winning Best of Variety Foreign Adult. Our RACCS star of the show was GrCh & GrPr Troika Ivan Tsarevich (RUS a) who won the Imperial certificate, Best of Breed, 1st in all his classes (a ‘red card day’), Best of Variety Foreign Neuter and Best in Show Foreign Exhibit – very well done Teddy! There were four Russian Blues and 15 Abyssinians entered at the Nor’East show, winning 13 certificates between them (including four at Olympian level), two new titles, six being nominated for BIS and two winning best of variety awards. A special mention is due to the Magleco Abyssinians, who had five out of five winners on the day, including one of the BOV wins! • Premier Shoelina Mariava Oleg (RUS a). Congratulations to our other nominated cats: UK&IGrCh One Shot from A’far (ABY o), Glendavan Calamity Jayne (ABY n); Shoelina Mariava Oleg (RUS a); UK&OBIGrPr Dushenka Zerachiel (RUS a); IGrPr Pontaby Ferragosto (ABY n), who also enjoyed a ‘red card’ day (ABY n); and GMC Stanley (Ped pet) on being nominated for best pet. It was a busy time for shows last weekend with three GCCF shows, plus great news from Australia too. There were 16 Russians and two Abyssinians entered at the Bedford and Cambridgeshire shows, held back-to-back on Saturday, with all Best of Breeds being awarded; 17 certificates being won; seven cats winning certificates in both shows; two new title winners; and a best of variety winner too! Congratulations also to our two new title-winners: Champion Kremlinkatz Katya Kalikova (RUS a)who won her title in the minimum possible number of shows, at exactly 10 months old on show day; and Grand Premier Shertejo Beliavitch (RUS a). Special congratulations go to our RACCS star of the show, GrCh Kremlinkatz Kara Karizma, who as well as winning an Imperial certificate and Best of Breed went on to win Best of Variety Foreign Adult in the Bedford show! Over in Australia the same weekend, there were some great results for RACCS members at a massive six-ring show in Perth over two days. Best Group 3 (shorthair) entire in every ring was a Russian Blue, with RACCS cats winning three of them: Ch Bluebebop Jazz Suite (RUS a) in Ring 4, and Kimara Azriel Buddy Awesome (RUS a) in Rings 3 and 5, living up to his name again by going on to win Supreme Exhibit in Ring 5! There was a special Australian Cat Federation award for just one cat in the show, representing merit in a breeding programme – special congratulations to the beautiful Russian Black girl GrCh Bluebebop Jazz Naima (RUS n) on winning this award, on the same day she qualified as a Triple Grand Champion! • our RACCS star of the show, Khabasha Ibnna Zahira (ABY n) who won Best of Breed usual Abyssinian kitten and Best of Variety Foreign kitten – a doubly special win as she is the first BOV winner for her prefix! And at a Russian Blue Special at the International Multisystems’ Cat Show “Spring Sodruzhestvo-14” in Moscow there were great results for two RACCS-bred cats. Many congratulations to Ch Hortytia Aurelia de Caritates who was awarded Best Female Russian Blue and Kremlinkatz Miron Khanov who was Best Junior Russian Blue. Congratulations to all our winners at the Essex show on Saturday, and special congratulations to our new title winner, Premier Siykat Lancelot (RUS a). RACCS cats enjoyed another great set of results from the shows on Sunday, when the Short-haired Cat Society (SHCS) show went back-to-back with the Midland Counties show for the first time. They were also joined by six breed shows with the result that the hall was full to capacity, and some entries had to be returned leaving those would-be exhibitors disappointed. There were three Nebelungs, six Russian Blues and one Abyssinian entered across the two shows with four cats winning certificates in both shows, a new title holder, a red card day winner and two best in show winners! Many congratulations to Merit Qualifier Evgeniya’s Xenia of Truevine (NEB), who won her Merit and Best of Breed in both shows, becoming the tenth merit-qualifying Nebelung in the GCCF. Congratulations also to GrPr Kremlinkatz Krystal Nikita (RUS a) who won the Imperial in one show, and the reserve Imperial in the other. Finally, to our two RACCS stars… GrCh Brunnbackens Leon (ABY n) won Best of Breed in both shows, the reserve Imperial in one and the Imperial in the SHCS, going on the win Best Foreign Adult and then Best in Show Foreign Exhibit! Similarly successful was Kremlinkatz Katya Kalikova (RUS a), only just adult and winning the Challenge Certificate and Best of Breed in both shows, enjoying a ‘red card’ day in the SHCS show, and then going on to win Best Foreign Adult and then Best in Show Foreign Exhibit in the Midland show! Over in South Africa, there were more excellent results for Russians with Azreal Pavlina Pinot (RUS a) being in the Top 10 kittens on show; Ch Azreal Nikimara Narzulah (RUS a) winning his Grand in all three rings and being voted Public’s favourite; and Wonky, the spotted Russian, winning Best Domestic Kitten on show! • IGrCh & Imperial Grand Premier Wavetail Domino, coming up for 9 years old, and the first Abyssinian to win the Imperial title both as an entire, and as a neuter. The star of the show, winning his first Olympian certificate, straight 1sts – a ‘red card’ day – the Best Temperament class for the fourth consecutive year, and Overall Best in Show was UK & IGrCh One Shot from A’far. This consummate showman is now 10 years old, and still every inch a winner – congratulations One Shot! Congratulations also to David and Louise Miskelly for having three Glendavan cats in the best in show pens, another grand champion title and winning people's choice and show managers choice! Great news from the Kernow show this Saturday – definitely quality rather than quantity today, with one Abyssinian, one Nebelung and one Russian Blue in the placings, with all three winning a certificate and their Best of Breed awards, one winning a new title and another winning a best of variety award. Congratulations to Grand Premier Larksong Prince Ruslan (RUS a) on his new title, and special congratulations to Adzwolo BMW Alpina (NEB) who won Best of Variety SLH Neuter – very well done Fewix! Over in the Netherlands on Sunday there were great results for a RACCS-bred cat, Abychat Pink Panther (ABY p), who did us proud at the NVVK show in Gouda by winning his BIV, Best in Show, and Best of the Best in Show – quite an achievement for a young Fawn Aby! A special mention also goes to IGrCh Melkelter Missfelicita (RUS a) who became the first female Russian to win an Olympian certificate at an all-breed show. Well done to all of you! There were two GCCF shows to report from this weekend, the Somali and the Surrey & Sussex, plus great news from overseas members. Between these four shows there were a total of four new titles and two best in show placings for RACCS breeds. At the Somali show there were two Nebelungs entered, both winning their Merits and BoB and one winning her new ‘title’, Merit Qualifier Adthilo Playmisty For Me (NEB). • Premier Silversmoke Estralita (ABY a). In South Africa there was a splendid line-up of 12 Russians at the SAASA (South African Abyssinian and Somali Association) show, with overall Reserve Best Kitten on Show being won by Azreal Sashina Saharz (RUS a). Over in the pet section there was an unusual sight – a pedigree Russian Blue Tabby called Wonky (a variety only seen in Australia and South Africa), who won his pet certificate. In Western Australia we had a new title holder and a best in show winner at a COAWA (Cat Owners Association of Western Australia) 3 ring show in Perth – many congratulations to Champion Bluebebop Bossa Nova (RUS n) on her title, and her half-brother CCCA Ch & Diamond GrCh Bluebebop Jazz Sonata (RUS a) who won Supreme Cat in Show in Ring 3, and was also awarded the trophy for COAWA Foreign Shorthair Cat of the Year 2013! • MasterCat Dorable (Ped pet) who won her title in three straight shows. Special congratulations to Kremlinkatz Katya Kalikova (RUS a) who won Best of Breed, Best of Variety Foreign Kitten, and Best in Show Foreign exhibit. Sadly Kali didn’t get to enjoy the view from inside her best in show pen as her human mum had an early pass from the show so she could get to the Siberian State Ballet’s production of Swan Lake! There were excellent results for RACCS cats from the other side of the world too, at a two-ring FCCWA show in Mount Hawthorn, Western Australia. 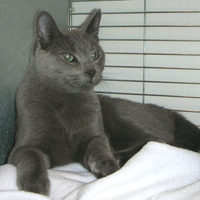 Reserve Best Group 3 Kitten went to a Russian Blue, Kimara Rosevel of Zakira – who also won the cat agility competition! Overall Best in Show went to another Russian Blue lady, Kimara Royal Blu Aschea – congratulations to both these beautiful girls. There were two Nebelungs, two Abyssinians and six Russian Blues in the placings at the Herts & Middlesex/Wessex back-to-back shows. All 14 best of Breed awards were made, 13 certificates awarded with two new title holders, a ‘red card day’ winner and a best of variety winner too! Three cats won their certificate and best of breed in both shows: Adthilo Playmisty For Me (NEB); Adzwolo Brumeux Gregor (NEB); and Syrinx Kadenza (ABY n). Congratulations also to our double red card day winner, who won 1st in every class entered, and Best of Breed in both shows, Larksong Lyonesse Limpet. Finishing a really excellent day for the Larksong household, special congratulations to GrCh Lyov Yarilo Larksong Dunoe (RUS a), who won Best of Breed in both shows, plus Best Foreign Adult and Best in Show Foreign Exhibit in the Wessex show! • Champion Sithee Madam Belladonna (RUS n), the first Champion Russian Black in the GCCF. Our RACCS star of the show was the Russian Blue kitten Koreshka Olexsa Bluestar who as well as winning Best of Breed, also won Best of Variety Foreign Kitten in a very strong line-up – very well done to you! The Midland Cat Club of Ireland, a GCCFI show, had one Russian Blue and one Abyssinian present, both winning their best of breed awards. Completing an excellent weekend for his prefix, Glendavan Highland Toffee (ABY b) enjoyed a great show debut not only winning best of breed, but also Best Foreign Kitten! There were excellent results for RACCS cats at two shows this weekend, first at the Norwegian Forest Cat show where there were three Nebelungs entered with Adzwolo Brumeux Gregor (NEB) winning another Merit, Best of Breed and Best Assessment Exhibit. • Champion Makima Solstice Sunrise (ABY o). Congratulations also to our two red card day winners, Dorable (Ped Pet) and Dushenka Lily-Belle (RUS a), who both won 1st in every class and Best of Breed. Highlights from the Croydon show on Saturday where there were three Russian Blues and six Abyssinians in four different colours in the placings. All seven best of breed awards were made, and special congratulations are due to our new title winner, Imperial Grand Premier Legend Iota Tigerlily (ABY n) who won her qualifying Imperial certificate. Tigerlily is also the first Imperial titled cat in her prefix, making her win doubly special! There were RACCS cats entered at two GCCF shows this weekend: the Shropshire show; and the Celtic LH&SLH. At the Shropshire there were 11 Russians entered and one Abyssinian, with all best of breeds being awarded. Special congratulations to our new title winner, Grand Champion Dushenka Gabriel (RUS a). At the Celtic there were three Nebelungs entered, all three winning their Merit certificates and placing well in side classes too. Well done to all of you! Highlights from the Southern Counties show on Saturday, with five Abyssinians in four different colours, four Russian Blues and one Nebelung in the placings. There were no new title winners but the adults did well, taking home an Imperial, reserve Imperial, Grand, Challenge and Merit Certificate. It was particularly good to see two beautiful Fawn Abyssinian kittens at the one show, especially as there were only three Fawn Abyssinians shown in the whole of last year! The first GCCF show of 2014 with RACCS breeds was the Notts & Derbys show, and a great start to the year with 17 Russian Blues (including one Pedigree Pet) and 12 Abyssinians winning all their Best of Breed awards, 12 certificates, three new titles and one 'red card' day and best of variety winner too. Special congratulations to our RACCS star of the show, Abychat Grayling (ABY a), who won Best of Breed, 1st in all her classes - a red card day - and Best of Variety Foreign Kitten!